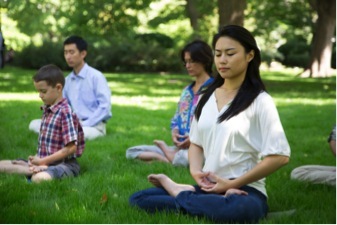 Falun Gong practitioners meditate in a park in Toronto, Canada. There have been a lot of negative news on Falun Gong in Chinese media since the persecution of Falun Gong was launched by the Chinese Communist Party(CCP) in 1999. However, the story in 1998 was completely different. Chinese Government institutes conducted health surveys about Falun Gong and fully supported it since it could save alot of tax money spent on health care. Mr. Li Hongzhi, the founder of Falun Gong, and some students participated in the 1992 Oriental Health Expo in Beijing, which was held at the World Trade Building in Dabeiyao from December 12 to 21. During the Expo, the powerful healing effects of Falun Gong caught people’s attention. Mr. Li became the qigong Master who received the highest number of awards at the expo and he received the award for ”Outstanding Contribution” at the Expo. Mr. Li Hongzhi also received awards in 1993 at the Oriental Health Expo in Beijing and he was awarded the highest award of the Expo, which was the ”Award for Advancing Frontier Sciences.” At the Expo, he also received the ”Special Gold Prize” and the title of the ”Most Acclaimed Qigong Master.” In 1998 five studies were carried out around China to investigate the health benefits of Falun Gong. Around 35 000 people were questioned about the health benefits from practicing Falun Gong and an estimated 98% of all subjects reported some kind of positive effects on their health. Furthermore, since the practice was free of charge and required no membership all kinds of people could join in, poor and rich. 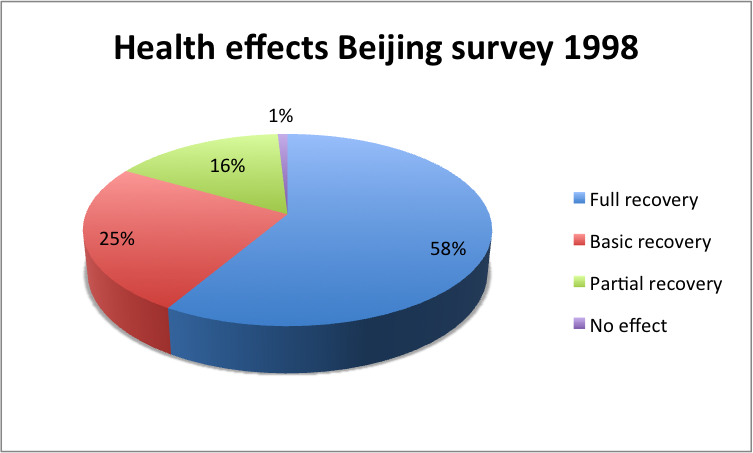 In 1998 several Medical Universities and hospitals in and around Beijing carried out a large survey of the health benefits from practicing Falun Gong. About 12 700 people participated in this survey. We have investigated the statistical results from this survey so that more Westerners have a chance to know the results. The survey carried out in Beijing in 1998 showed that 99,1% of the survey respondents had a beneficial health effect. Actually 58,5% achieved a full recovery from their disease(s). Falun Gong seems to be something quite miraculous when it comes to healing the body holistically by practicing cultivation of body and mind. The mind controls our body is an old saying which is appropriate but without working on your body it´s hard to achieve a complete effect. Falun Gong is not primarily about exercises, the main point is actually to improve one´s mind in line with Truhtfulness-Compassion-Tolerance since our mind has a big impact on our body. 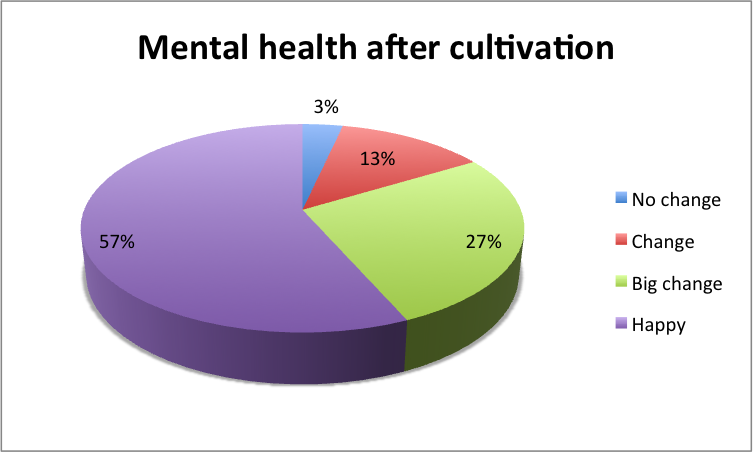 Take a look at the effects on the mental health on the subjects in the Beijing health survey below. 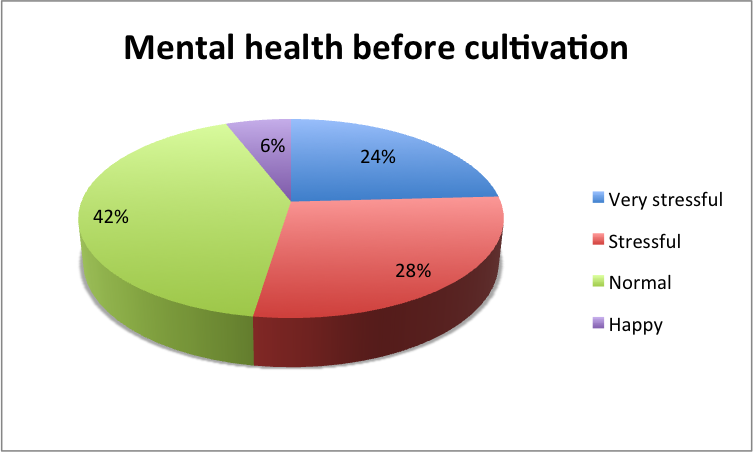 The survey showed that 96,4% had a definite improvement in their mental health and a stunning 56,6% felt joyously happy after starting to practice cultivation, compared to 5,9% before cultivation.These results are remarkable and shows that every person can alter their health state if they are prepared to work hard on their character and their physical body. People need motivation to change themselves and then there will be a big effect on their whole life. Because of the extremely positive health effects of Falun Gong the number of practitioners exploded in China and according to the CCP´s own estimates there were at least 70 million Chinese practitioners in 1998. That made the CCP´s leader Jiang Zemin, incredibly jealous, and he launched a full scale illegal persecution of Falun Gong in 1999 and started a secret police, the 610 office, to persecute Falun Gong. Falun Gong practitioners try to follow the principles of Truthfulness-Compassion-Tolerance in their daily lives, hence improving their quality of life quickly. In Falun Gong there is a deep spiritual belief but it´s not based on religious rituals and there is no membership and it´s completely free of charge. All information can be downloaded free on the Internet and the group practice is also available for everyone free of charge around the world. In reality the atheist CCP was scared to death when they saw more and more Chinese joining the Falun Gong exercises. Finally it reached a point where there were more people practicing Falun Gong than there were CCP members. At that point the CCP used their usual strategy of spreading slanderous propaganda against Falun Gong, claiming that these people were suicidal, that they even kill their own children and that they belong to an evil sect sponsored by the CIA. The data from the health surveys before the persecution in 1999 remains the same no matter how many slanderous lies the CCP spreads. In fact Falun Gong has spread all around the world and there are Falun Dafa practitioners in more than 100 countries today. For those who are interested in learning more about Falun Gong, please visit www.falundafa.org – on the website all exercises and books are available for free.